The Knights of Columbus proudly supply this Frontline Faith MP3 player in hope that these audio recordings help our Service Men and Women deal with the rigors of service, especially during deployment to locations far from home. Find Out How You Can Help Give The Gift Of Spiritual Strength & Support. Click Here. The Knights of Columbus is the world’s largest Catholic men’s organization with more than 2 million members on three continents. The Knights have a long history of supporting those who serve in uniform and in welcoming Catholic Soldiers into their ranks. For almost 100 years, they have provided significant spiritual support for our Armed Forces. Today, they work closely with the Archdiocese for the Military Services, USA. 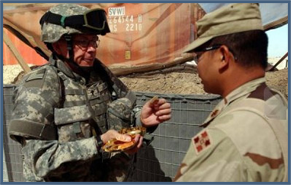 The Knights of Columbus proudly support and supply this Frontline Faith MP3 players in hope that these audio recordings help our Service Men and Women deal with the rigors of service, especially during deployment to locations far from home. “Freedom always comes at a high price. It requires a generous heart, ready for sacrifice. from our own personal responsibility for freedom. The Frontline Faith Project is an outreach project of Mary’s Touch, a registered trademark of Mary’s Touch, Inc., a 501(c)(3) nonprofit organization.